The entrance to the former Casemate Barracks. 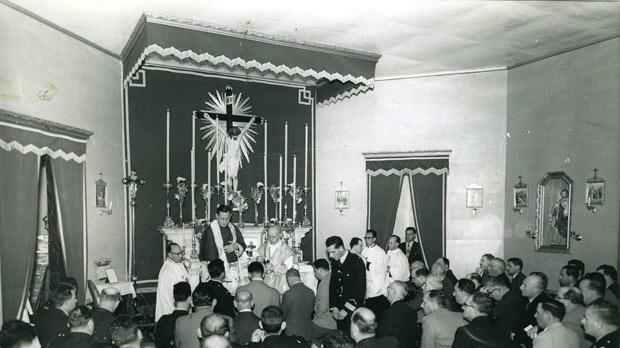 Archbishop Michael Gonzi celebrating Holy Mass at the police chapel in the 1960s. The iron tent structure which was removed in 1970. 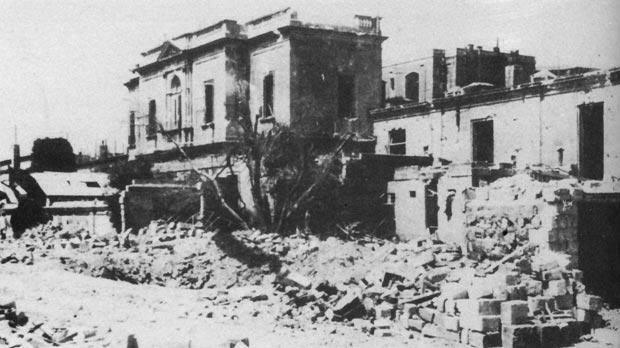 The Central Hospital was damaged by enemy action during World War II. 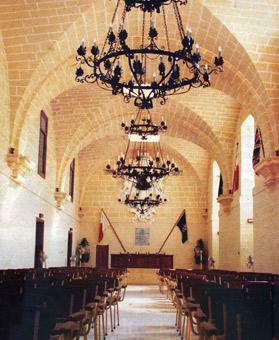 One of the restored halls at Police General Headquarters. Since its establishment in 1814, the police department used various buildings as police general headquarters. In 1814, the police commandant Francesco Rivarola had his office in the first law courts building in Valletta, the Klistanija (today occupied by the health department). Eventually the Office of the Inspector-General of Police was transferred to the Governor’s Palace, with the entrance in Archbishop Street, Valletta. In May 1872, the Police Office moved to No. 152, Strait Street, Valletta, the basement of the Auberge d’Auvergne, which at the time was the law courts building. Some months after Commissioner Harry Bamford’s appointment in July 1919, it was announced that the Valletta military hospital (the former Sacra Infermeria), was to serve as the first police headquarters. On December 1, 1919, a police training school was opened in this building, and eventually all police branches were accommodated in this headquarters. The old hospital chapel was re-consecrated by Bishop Angelo Portelli on September 26, 1920, and on Sundays and feast of obligation, Mass was celebrated in the chapel, which was dedicated to the finding of the Holy Cross. After the outbreak of World War II in September 1939, the police headquarters was transferred to the Conservatorio Vincenzo Bugeja in Fleur-de-Lys. Philanthropist Vincenzo Bugeja had built and financially supported this place for orphans, who were looked after by the Sisters of Charity. The building, requisitioned by virtue of the 1939 Emergency Powers Regulations, housed the Lieutenant Governor’s Office, the police department, the office of the Attorney General and the Treasury. When the Marquis Paolo Apap Bologna, the president of the committee administering the orphanage, requested the Governor not to requisition the institute, he was told that it was necessary. The Governor had told him that after the war, the building would not be used more than was necessary. However, when the war ended, the police could not return to their former headquarters as nearly half of the building had been demolished by enemy action. 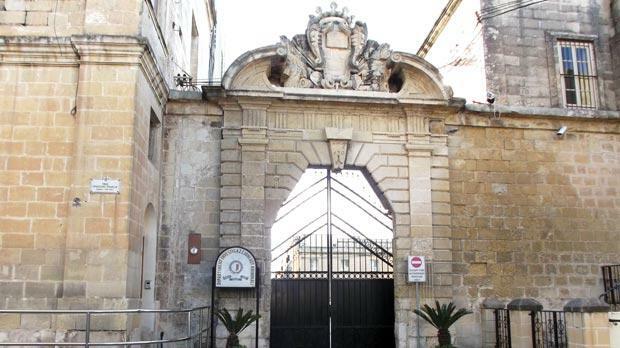 Meanwhile the 50 girls in the Fleur-de-Lys orphanage were transferred to the Good Shepherd Convent in Balzan and the police remained at the Conservatorio. In February 1954, a judicial protest was made against George Borg Olivier, as head of government, to vacate the premises. Some days later, the commissioner of police was directed to move to another headquarters. The place chosen was the former Central Hospital at St Calcedonio’s Square, Floriana. At that time, the migration from the Central Hospital to the newly constructed St Luke’s Hospital had been completed. However, the dermatology, venerology and ophthalmology departments were retained at the Central Hospital. The police started occupying the building at Floriana on March 15, 1954, but the passport office and the criminal records office were transferred to Floriana some days earlier. It was said that this was to be a temporary measure until suitable alternative premises were found; however, the police have remained in this building to the present day. The first part of the building that today houses the police general headquarters at Floriana was built in 1725 during the reign of Grand Master Manoel de Vilhena. The building, which at that time was known as Casa d’Industria, was used for the poor girls of Floriana, Marina, Ħamrun, and Pietà. The girls were taught needlework, the English language and other useful subjects. In 1825, Governor Lord Hastings ordered some improvements to be made to the building, and handmade lace-making and carpet-making were included in the trades taught on the premises. In 1848, the house of industry was enlarged, and two years later it was reconverted into a central hospital. Patients from the Valletta Civil Hospital and other hospitals were transferred to the new hospital. By 1872, the Central Hospital was over-populated with patients and the hospital corridors had to be used for some of them. In 1885, plans were made to built a new hospital to house 354 beds; however, the project was shelved until 1927, when the Legislative Assembly voted the sum of £75,000 for the construction of the new hospital. 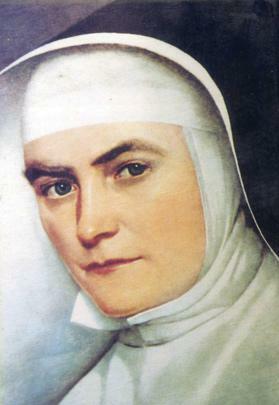 Nuns of the Sisters of Charity were employed at the Central Hospital, and on May 23, 1926, the nuns celebrated the beatification of Sr Giovanna Antida Thouret, the founder of the Sisters of Charity. The ceremony was held at the hospital’s chapel, which at that time was on the first floor of the building. Sr Paola Alfieri, the mother superior, attended the ceremony in a wheelchair as she was suffering from acute rheumatism and other illnesses. All of a sudden and to the astonishment of those present in the chapel, the mother superior felt the strength to stand up and kneel down. Amid great emotion the mother superior said she had been cured. Later that evening she walked to the refectory where she dined with the other sisters, something she had not done for a long time. Four Maltese doctors declared that the nun had been cured through a supernatural intervention. This statement was confirmed by three medical specialists sent from the Sacred Congregation of Rites. After examining the case, the Congregation for Saints’ Causes approved the Central Hospital miracle, as well as another miracle that had occurred in Naples. The congregation declared that the two miracles were attributed to Sr Antida Thouret, and in 1934 the sister was canonised by Pope Pius XI. Before Italy’s declaration of war in June 1940, some sections of the Central Hospital were transferred to other emergency hospitals to provide accommodation for eventual casualties. The hospital was extensively damaged by enemy action in May 1941, but there were no casualties. However, the patients were removed until essential repairs were carried out. All police branches were housed in the new headquarters in Floriana, except for the mounted section which remained at Marsa. The Criminal Investigation Department occupied the left wing of the building while the traffic branch and licensing office were housed in the right side hall, one of the largest halls of the building. Movable cubicle walls were erected in this hall to make offices for the commissioner and other senior officers. Eventually the senior officers had their offices in the first floor of the building and the commissioner chose the office at the far end of the right side corridor. The chapel in the first floor was transferred to the place where it stands today, namely the ground floor, to make space for the police secretariat office. The police vehicles were garaged in the basement of the former hospital with an entrance from the lower part of Vincenzo Dimech Street. The fire-fighting section was stationed adjacent to the main entrance of police headquarters. In 1970, the police garage and fire-fighting section were transferred to Notre Dame Ditch at Sa Maison. 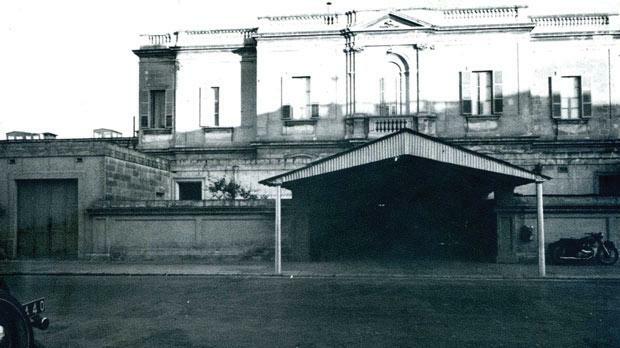 In April 1960, the police also made use of the former Royal Navy Picket House in Pope Pius V Street, Valletta, to house some police offices. However, the police moved out of the building in May 1964 and it was eventually demolished to make way for the new City Gate project. With the increased personnel in the force and the number of civilian clerks employed at Police General Headquarters, space became a problem and the necessity arose of new offices and stores. For this reason, in 1964 the police obtained part of the adjacent building, namely the ex-dermatology, venerology and ophthalmology departments. This space was utilised as dormitories, for storage purposes, offices and a medical inspection room. The other part of this building was subsequently handed to the police on May 11, 1968, and it was occupied by the Criminal Investigation Department. In 1965, the construction a new police telephone exchange started in one of the yards of the building. This new building, completed in August 1966, housed the police control room and an operations room. Meanwhile, workshops were built in the other yard adjacent to the quartermaster stores. After the British military authorities vacated Casemate Barracks in 1969, the Criminal Investigation Department was transferred to this building, situated below the police headquarters. A new police training school was also established in this old barracks. However, in 1972, the police had to give up the building housing the training school to the Education Department which turned it into a lending library. Eventually, the library was transferred to another place and a forensic laboratory was set up in this building. The iron tent structure in front of the main entrance of the police general headquarters was removed in 1970, and since 1979, the building underwent massive changes and renovations with works mostly done by members of the force. Moreover, the licensing office was transferred to Hornswork Ditch in Floriana and the workshops were transferred to Notre Dame Ditch. The chapel also underwent changes and a police museum was opened in July 1994. Eventually, a crime museum was also established and both museums are open to the public.